Durable Wiley X PT-1 Prescription Sunglasses are totally unique. Computer generated sun glass eyewear designs enhance comfort for the optimal fit in sunglasses. Wiley X PT-1 Prescription Sunglasses are perfect sun eyewear for motorcycle riding or recreational activities. 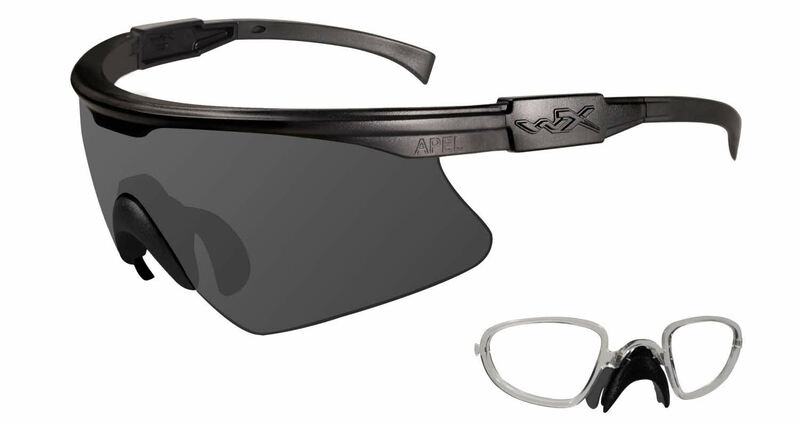 Wiley X PT-1 is a Semi-Rimless frame for Men, which is made of Plastic. Ideal for usage with: Eye Protection, Safety, Military, Ballistics Rated, Fishing. Wiley X PT-1 RXSunglasses come with a cleaning cloth and protective carrying case. I ordered these with an RX insert for indoor shooting sports. Received them with the smoke lens instead of the clear, so as with other reviewers who mentioned this - it was nearly impossible to get the shield off (in a fit of anger, the burst of hand strength it took did the trick apparently - I had given up twice by then). I got the clear shield on - I put the Rx inserts in and that pretty much just made me even more angry. The insert lens created a glare on the shield lens. Really? How am I supposed to shoot with not only the glare, but about an 80% reduction of field of vision with the inserts in? Not to mention, adding the Rx lens insert made them virtually un-wearable in the fit category. No amount of nose band adjustments would keep the frames up on my face or off my eyelashes. Super frustrating. It was a no brainer to send the whole caboodle back. Bummed about losing money on the Rx part, but wow, these would have been totally useless with the inserts. Without the inserts - they fit just fine, like any shield would and would work for said purposes. But hardly worth the frame price for some glorified shields that you can't easily change the lenses out of and could get similar fitting/looking versions for far less. The Rx option was my selling point - and my biggest returning point.